BLOG UPDATE: I added a new page titled Music Muses where you can find a list of songs and videos that have inspired my books/writing. 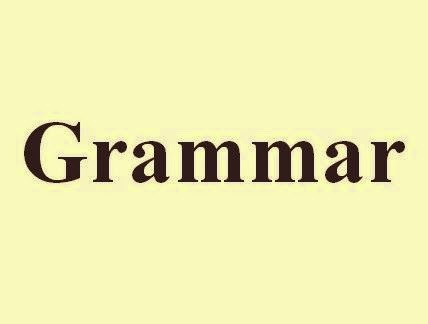 Grammar confuses many people, and countless people use words and phrases incorrectly. This post is meant to clear up some of that confusion by highlighting the words and phrases that are most often used incorrectly. “Your” is possessive whereas “you’re” means “you are”. The point of this statement is to show that you don’t care at all. By saying, “I couldn’t care less” you’re making it clear that you already don’t care and it’s not possible for you to not care anymore than you already do. A trooper is an officer or soldier. A trouper is someone who is hard working and uncomplaining. “Alright” is not a real word and an incorrect spelling of “all right.” So make sure that you use two words instead of one word. NOTE: Because of the simplification of writing due to texting and social media, the use of "alright" has become more popular. You could use "alright" in dialogue for YA books, but editors still tend to nix it outside of dialogue, which is why I added it here. Incorrect: Try and... "I want to try and write a book." Correct: Try to... "I want to try to write a book." Using the word “to” indicates exactly what you want to do, which in this case is "write a book", but if you use “and” you’re combining two things. You don't have to try first and then write a book you only need to try to write a book. “All ready” means “prepared.” Example: I’m all ready to go to lunch. If you use a verb indicating movement, such as ran or skipped, it will be paired with “past.” Example: I ran past the post office. If there is no verb indicating movement you would use pass. Example: You will pass the post office on your right. Both are correct. “Toward” is common in the US, and “towards” is common in the UK. Again, both are correct. “Backward” is common in the US, and “backwards” is common in the UK. “Neither” means not any of the valuable options. Example: I’m voting for neither, because both candidates are idiots. “Either” means one of the two valuable options. Example: I love white chocolate and milk chocolate, so either one is fine with me. Example: The special effects made the movie much more exciting. Example: Her medication affected her mood. “A part” means a portion of a whole. Example #1: I am a part of this world and so are you. Example #2: I found this letter. I think it’s a part of the clue. “Apart” means separated by a distance, or something that is broken. Example #1: The ground broke apart during the earthquake. Example #2: Fifty miles are keeping us apart. SHARE: The correct uses of word/phrases you know people use incorrectly. QUESTION: Has one of the above words or phrases caused you confusion? Its and it's - I see those mixed up. Great tips, Chrys! I still get confused with words like "all right and alright" or "past and passed." I usually have to google or grab a dictionary online to make sure I am using the correct grammar. I guess we are not always perfect! People saying "I could care less" is one of my biggest pet peeves. I got to do a presentation for my copyediting class on the correct usage of the phrase, which was a lot of fun. I'm totally jealous of how far you are in your A to Z posts. I don't even know what to do as a theme yet. I know a lot of people whose pet peeve is the same. You'll think of a theme soon. My theme was super easy, but if I do A to Z in 2016, I'll have to think long and hard about the theme. I think I'm guilty of the trooper/trouper. I remember an english teacher telling us that the 's' on backward was incorrect. I never realized it had to do with which side of the Atlantic you live on. My one publisher asks us not to use British English like grey. I'm guilty of trooper/trouper, too. I wonder if books published in both places change toward/toward, etc to accommodate both sides. I use both toward and towards, backward and backwards, though I lean towards the forms with an S on the end. I really think this was influenced by how many older books I've read (and how much British music I've listened to), since I really didn't know till very recently that those are considered more British spellings. I also favor the spelling grey, as well as using a few other spellings I picked up a long time ago, without realizing they're British in origin, such as learnt, burnt, spoilt, dreamt, and travelled. To me, it just looks weird to write "learned" instead of "learnt," unless we're talking about the word "learnèd," with the accent mark, to distinguish the meaning. I'm really embarrassed for people who don't know the difference between your and you're, or whose and who's, its and it's, there, their, and they're, were, we're, and where, then and than. Isn't that something you're supposed to have learnt by the time you're in sixth grade? Those are things we should learn in sixth grade and even younger, but it seems as though people forget or get lazy and don't care, because countless people who the incorrect forms of all of those you mentioned. Thanks for the reminder about alright/all right. So do I, but I usually catch myself. You and you're drive me crazy when people write them incorrectly! Great post, Chrys! Effect and Affect still get me sometimes. Try and and try to...great reminder! Yay, I knew these! I'll admit to liking towards over toward and Grey over Gray...I use the correct ones but I really like the UK ones visually hahaha. I also like grey better than gray. I always laugh about alright vs all right. In modern uses that rule no longer applies--due to evolving language. There are instances to use both actually. True. Especially with the simplification of writing due to social media and texting. Also, people saying "I could care less" drives me nuts!! I agree, too, but many editors still nix "alright," which is why I added it here. "Alright" is good for dialogue though, especially for YA. Okay, so...I totally didn't know about "trooper" vs. "trouper." Goodness! You learn something new every day! As always, great post! Thanks for sharing these tips. Useful tips for those who should know better. Alright is used a lot and I think it's because writing has simplified due to social media and texting. That's okay, because so am I! I hate when people use "and" instead of "to" in front of a verb like. It makes me cringe. Me to! I always fix it when I beta read. Nice reminders. I knew them all, but when I'm typing fast I know I make mistakes. I type really fast too and that is when the mistakes happen. Affect/Effect is one I always have to think carefully about. I have to think carefully on affect/effect, too. Alright gets me the most, though I won't argue with the grammar and style books. I grew up with the two spellings having completely different meanings. All right meaning all correct, and alright meaning agreement or the state of something's condition. We should go to a movie. - Alright. Did you hurt yourself? - No, I'm alright. Oddly enough, the word "okay" could be substituted in both places. Since it is colloquial, I find no issue with it when the POV is deep and unpretentious, and would expect it along side other slang within the narration or dialogue, especially since the spelling dates back to the 1800s. If the narrator is supposed to be a studious sort, then I would expect to see "all right". Now, if someone could please explain why US style standards says the period should be inside the quotes even if the words aren't said (such the last sentence in the last paragraph), I would appreciate it. That I just don't understand. You make a good point with alright, Loni. And I won't be able to explain why the period goes inside the quotes even when it's not dialogue. Sorry.